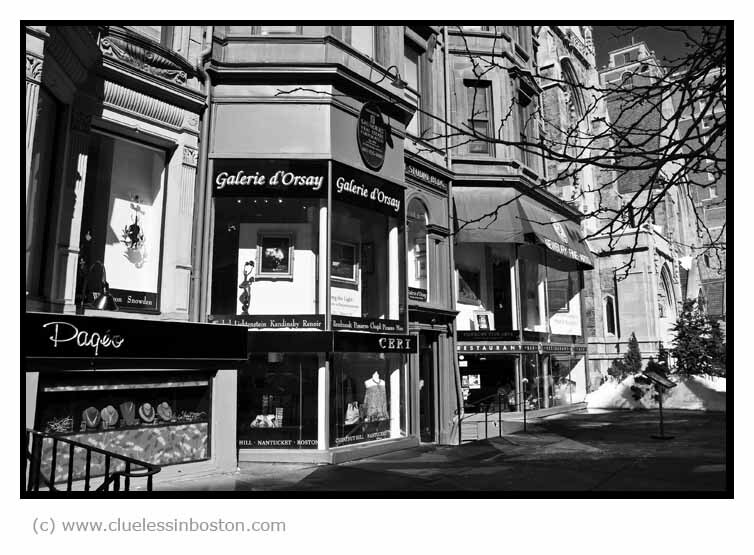 Some of the businesses on Newbury Street. excellent in black and white. i like the details. Wow, Galerie d'Orsay, huh? Sounds very Parisian! :-) Nice shot. Great composition. B&W was the perfect choice. In this delightful street we can find a established Fine art Gallery! makes me wanna be there. Great photo. I miss seeing these unique buildings. We have nothing like them in Seattle. Lovely photograph. The business that I can see have French names...is that true of all of them? And I think that is a church in the background...maybe a French church...Church d'Orsay? Heh. Heh. Well you know I rate your photography. This has a wonderful use of light and is very timeless. i miss Boston !!! History ozzes out of every corner !!! great pic !!! Love the full tonal range in this one.